Hard problems keep earning compound interest, but advanced age and distance from complexity can act as a wonderful solvent. Now that I qualify for Medicare, this syndrome bothers me less than hearing simple solutions from those who cannot use the aging process as an excuse. In arms control debates, there is no shortage of easy answers and simple solutions. Absolute conviction comes with this territory. Conviction can be admirable. Conviction can help good things get done, or block bad things from happening. The certainty that comes with conviction bears watching, however, since certainty is usually not wisdom’s first cousin. When conviction and certainty move full steam ahead – and damn the torpedoes — the results can be very messy. One of my recommendations for aging is to keep your convictions while being wary of certainty. This takes far more intellectual effort than relying on simple assertions. Assertion and politics are never strange bedfellows, but conviction seems to be crowding out wariness and analysis more than I recall. As the Scopes trial attests, there’s nothing new about questioning evolution, but assertion now trumps science in other areas, as well, most notably climate change. Economic prescriptions were deeply shaken by the Great Depression, but not after our current Great Recession. Failed economic remedies continue to be sacrosanct. In my day, it was Peace Now! Today, it’s Assert Now! Predict gains that would make even Bernie Madoff blush, and have somebody else pick up the tab when conviction collides with reality. Out-assert the competition. Blame your opponents for the sins you are committing while feeling blessedly free of embarrassment. As presumed gains disappear and losses mount, don’t budge an inch: just keep asserting and blaming the victims. Conviction politics means never having to say you’re sorry. In the United States, these tactics are now mostly the province of the national Republican Party. True, Democrats also have their own sacred cows and fund-raising imperatives. But for now, Democrats are on the defensive for not having enough conviction. Maybe I’m paying way too much attention to the Republican presidential debates. The GOP represented up there on stage bears little resemblance to the one I grew up with. Come to think of it, the same holds true for the Democratic Party. There’s one assertion I can make with complete conviction: In this season of Thanksgiving, count your blessings. Daily aggravation is always trumped by feelings of gratitude. One of my blessings is a writing gene inherited from my father. My blog posts over the past two and one-half years have become a book. 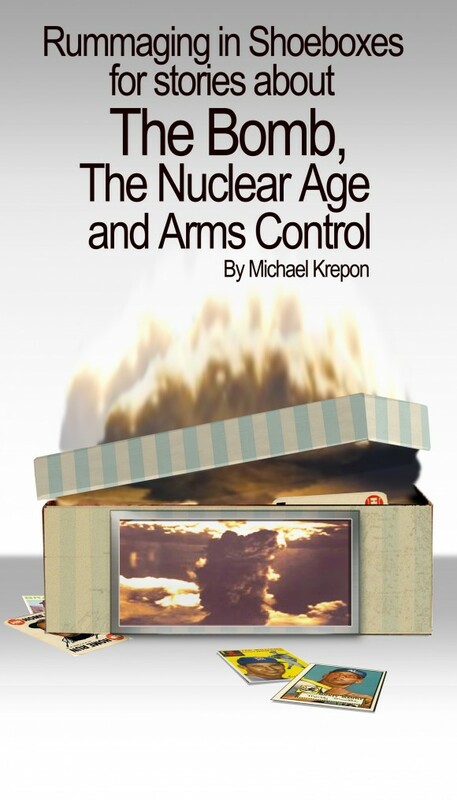 Rummaging in Shoeboxes for Stories about The Bomb, The Nuclear Age and Arms Control, is now available on Kindle. The cover art comes courtesy of the multi-talented Suzy Parker. Part of the problem is that there are too few _real_ conservatives left at all. It also means conserving money and conserving American lives for real national security issues. Andrew Bacevich may be one real conservative, Ron Paul another. Who are the real small government, small defense, actually-served-in-the-military, mostly isolationist conservatives — any other names? Barry Goldwater didn’t appeal to me when I was growing up, but now I am inclined toward his several of his notions of Conservatism, which I define as: be wary of too much government, especially a government that seeks entry into the bedroom and that seeks to criminalize victimless personal behavior. Ron Paul’s international positions would have offended Goldwater. We live in an age where moderation is the fastest route to perdition. A thought: nuclear policy between 1945 and 1960 was driven by unstated certainties of men who had fought a large conventional war, WW II. Those certainties were clearly in doubt, because “we are now in a totaly new situation which cannot be resolved by war.” But the people involved did not believe it. Congratulations, Michael, on hitting Medicare before it goes bust or is “killed” as an economy measure by our 9% popularity Congress! Make sure you get also parts B and D(including the “Donut hole”). There is nothing wrong with having strong convictions, even if wrong (one can learn…sapiens!). For example, irrespective of whether total nuclear weapons abolition is doable or is socially and politically good or bad, opening intelligent debate would be beneficial to understanding (food for thought)and hopefully less bellicosity. Why we can’t abolish completely nuclear weapons? Why we can’t “nuke” an enemy? Why we can’t test new designs? What is the meaning of “safe”? I am reminded of a paragraph in John Nuckolls history of Laser ICF, where he mentions the design in 1962 of an isentropically compressed secondary, designed, built, and tested in a couple of months and that today, it would’ve taken years. Same about John Glenn, who flew atop an ICBM (Atlas) where we replaced an H-bomb with a capsule just big enough so he can fit in it. Today that would be impossible with the risk-averse and ignorant society we live in…where everybody’s concerned about political correctness and covering one’s posterior. Looking back I think the Soviets and Americans drove each other to look at each other in the mirror. I’ll never forget the Nov (I think) 1988 evening when Edward Schevardnadse said on “The McNeil Lerher News Hour” the USSR was going to do a very mean thing to the United States. He said they were going to take away our enemy. As a young 19 year old who had been reading Pravda and Izvestya on a regular basis for 5 years already, I took pause. I also reflected on that all through the 90’s thinking that Edward was wrong, we were not becoming what the USSR warned the US would become without someone holding a mirror for us to view ourselves through someone elses eye. When you array 60+ motorized rifle divisions, and a strategic rocket force against someone, people listen. Sad as it is to think that it was the Soviet military that made Americans ask themselves if they really were imperialists. After 9/11 I’ve learned a few things what must be human nature in general. The way the US fell right into the old Soviet scripts for a uni-polar world, and the ways in which the USA adopted many of the foreign and domestic policies of the USSR was absolutely surreal. It staggers me to the degree the Russians understood American conservatives, and to the degree that American conservatives sound, act, heck even wear the same flag pins, of old guard Soviets. I have a friend from high school who’s been involved with the post 9.11 world since day 1 and he wears a suit with all his fruit salad and medals. He’s decked out like the old vets of the Great Patriotic War. I think when battling extremism you first have to identify what is really driving an ideology. Watching American conservatives today is like trying to get into the heads of the old Soviet guard when I was a youngster. I get the same gut feeling when I reduce the arguments of the old Soviet guard and modern American conservatives. They try to address their fears of attack with open ended brute force. Or at least the illusion of it. 9.11 drove America into a spiral of fear that in turn drove a need to counter the imagined threat with as much raw power as could be gained. With the KGB and STASI gone, and no longer oppressing or spying on the masses of Eastern Europe, the US was free to fall right in line with the same patterns of the old Communist Bloc. With the Communist Bloc, no longer espousing the exporting of revolution by force, people like Wolfowitz and David Frum became free to do the very same thing. With the Communist Bloc gone, the US was free to begin to act just like it. I think the two systems suffer from the same illness. Both suffered from an open ended need for military might in order to address an open ended and imaginary theory of threat. I think the arms control community might be well served if it could find a way to educate the public on the nature of arms, and how they can, and cannot serve to address a real threat, and more important, what constitutes a real threat. So long as the public lives in as much fear of religious nut cases living in caves and slums as they did the Warsaw Pact and the Soviet Strategic Rocket forces, they can be herded to drive the West into any number of crazy directions. Ha, this is true, but in exactly the opposite way from what you think it is. Congrats on book. That’s probably the best way share the contents of the ‘Krepon Shoe Box’ (KSB). I have a Galaxy Tab and I am weighing the cost/benefit of first getting Kindle app and then book against getting a hard copy plus the prospect of your autograph. Kindle wil probably lose. On ageing, I think both men and the arms control debate must age gracefully. By ‘grace’ I mean the realisation that we will be held accountable for what we leave for the posterity. God bless you and congrats again.